Restore the integrity of your smoke chamber, and make your fireplace safer, and more efficient. According to the National Fire Protection Association (NFPA), defective smoke chambers are the third leading cause of chimney related house fires. For the safety and efficiency of your fireplace, it is important that any gaps, cracks, or holes in the smoke chamber be sealed and the brick corbelling be made smooth. 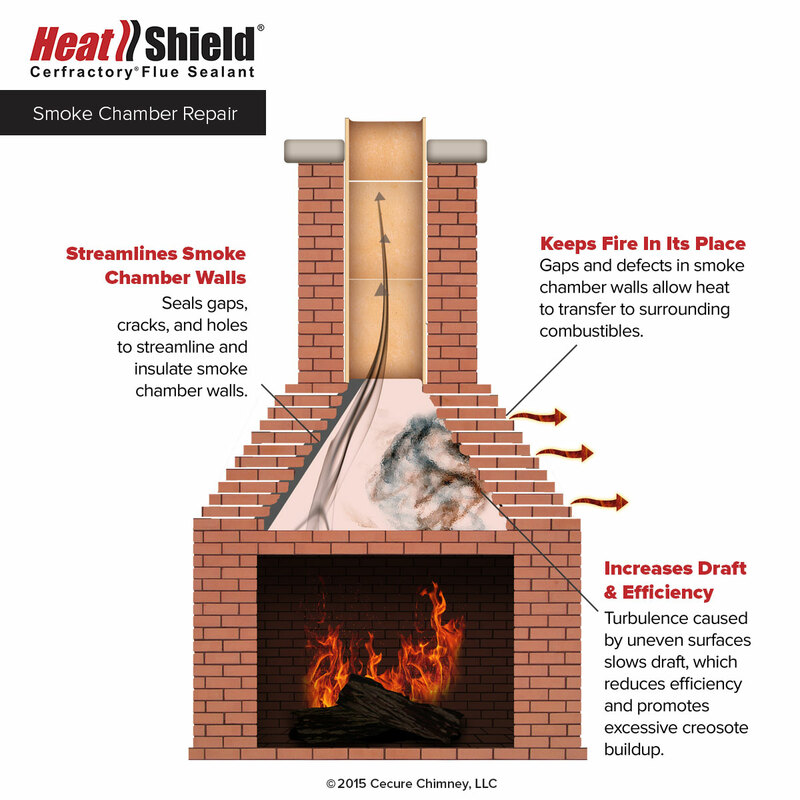 Because the smoke chamber is a “high heat” area, any gaps, cracks, or holes can allow excessive heat to attack any surrounding wood or combustibles. The jagged corbelling slows the draft and will provide more surface area for highly combustible creosote and soot to form. 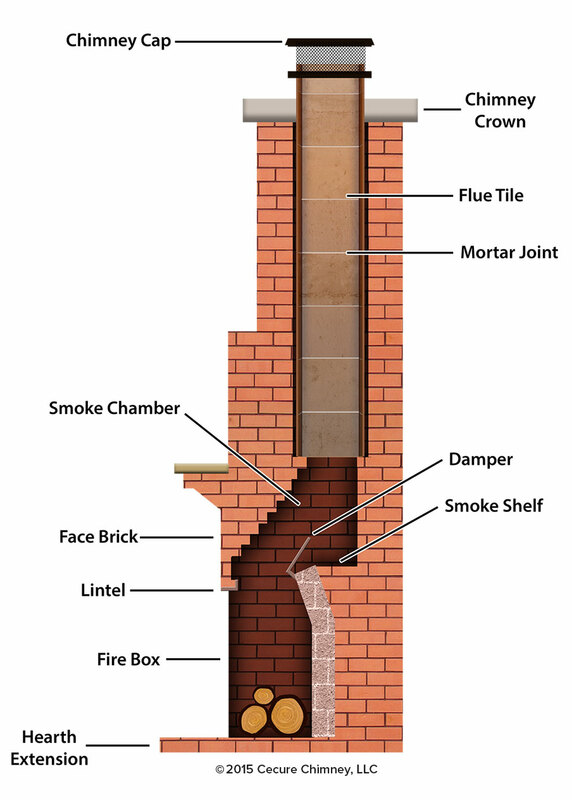 In your masonry fireplace there is an area called the smoke chamber. In most fireplaces it can be viewed by shining a strong light up through the damper. Its function is to safely transition smoke and hot gases from your fireplace to the narrow flue of your chimney. Roughly the shape of an upside down funnel, the smoke chamber starts just above the damper and ends where the chimney begins. The brick along the sides of the smoke chamber are often stepped outward one above the other, upwards until they meet the flue. This is a process called “corbelling”. The corbelled brick in your smoke chamber will look like an upside down staircase. Exposed corbelling increases smoke turbulence and reduces the efficiency of the smoke chamber. This allows dangerous creosote and soot to build in the smoke chamber and flue liner. To protect the integrity and increase the efficiency of your smoke chamber, the corbelled areas and any gaps, cracks or jagged edges should be coated and parged smooth with an insulating high-temperature mortar such as HeatShield Chamber Coat or Cerfractory Foam. Both Chamber Coat and Cerfractory Foam are insulating, high-temperature refractory mortars, developed specifically for parge or spray coating smoke chamber walls. When properly applied, they will restore the integrity of your fireplace. Both products insulate, seal gaps, and smooth the smoke chamber walls as required by both NFPA and IRC codes. Chamber Coat and Cerfractory Foam have been tested and listed by Warnock Hersey Hearth Products Testing Lab to UL Subject Standard 2505 - Cementitous Materials Used for Resurfacing Smoke Chambers of Masonry Fireplaces. This rigorous testing included, Brand Fire Test, Flash Fire Test, Resistance to Action of Acid Test and Freeze/Thaw Resistance Test. Both products were tested to ASTM C-199 and proven to withstand temperatures in excess of 2500F, (roughly two times the operation temperature of the average fireplace). When Chamber Coat or Cerfractory Foam are used to restore the integrity of your smoke chamber, you will have the assurance of knowing your fireplace is made safer and more efficient. Your professionally applied repair is backed by a 20-year material warranty. Ask your chimney professional for details. Use Chamber Coat for hand-parging or trowel-on applications or where smoke chamber is easily accessible. Use Cerfractory Foam, a sprayable material for applications where smoke chamber is not easily accessible.